Is It Time to Buy BlackBerry's Resurgence? The software push is reaping solid results for the Canadian tech giant. BlackBerry's (NYSE:BB) transformation into a provider of software and services is now complete. The company's reliance on its legacy smartphone business has been pulling it down, but that won't be the case going forward, as the company's third-quarter results show. The company didn't get any revenue from selling devices last quarter, while the related service access business generated just $9 million, which isn't even 4% of the total top line. BlackBerry got the majority of its revenue by selling enterprise software and services, technology solutions, and licensing. The good part: These segments are enjoying robust growth momentum that won't be dying out anytime soon. BlackBerry now gets nearly 43% of its revenue from the enterprise software and services business. Bears might argue that this segment isn't in the best shape, as revenue in the latest quarter dropped 7.5% year over year. But there's more here than meets the eye. BlackBerry's implementation of the ASC 606 accounting change in the first quarter of the current fiscal year means it's facing unfavorable year-over-year comparisons. That's because, under ASC 606, BlackBerry isn't recognizing revenue from enterprise software sales on an up-front basis. Instead, the company's perpetual licenses are now recognized on a subscription basis over a period of four years. However, there's enough evidence that the enterprise business is on a growth path. BlackBerry recorded 7% sequential growth in this segment last quarter, following a double-digit sequential increase during the second quarter of fiscal 2019. But the more important thing to note is that this business carries tremendous potential, thanks to the solid contract wins BlackBerry has scored. For instance, BlackBerry is now selling enterprise software to eight U.S. government agencies, compared with six in the previous quarter. What's more, the number of users on BlackBerry AtHoc -- the company's crisis communication software-as-a-service platform, authorized by the Federal Risk and Authorization Management Program -- increased 20% in the latest quarter to 1.2 million users. Gaining traction in the U.S. government cybersecurity space will be a long-term driver for BlackBerry, as the federal government has been gradually ramping up its cybersecurity spending. But government contracts are just one of the things driving the company's software growth. BlackBerry has set out to build a platform that encompasses the privacy and security needs of an organization under one umbrella -- BlackBerry Spark. More importantly, the company is looking to push the envelope by adding more solutions to its portfolio. That's why it has spent $1.4 billion on cybersecurity provider Cylance, which will bring artificial intelligence and machine learning capabilities to its cybersecurity offerings. Such moves will help BlackBerry offer more to its existing clients, while opening up an opportunity to sell its existing solutions to the newly acquired Cylance clients. Cylance is going to open up a massive opportunity for BlackBerry to boost sales and enjoy higher margins, because the former has over a hundred Fortune 500 clients, which are a part of its 3,500-strong enterprise client base. Meanwhile, BlackBerry's technology solutions business is getting a nice shot in the arm from automotive design wins, as customers are lapping up the QNX software platform to power various aspects of connected cars. In all, BlackBerry's revenue from its technology solutions and licensing businesses rose 30% year over year last quarter. These two businesses account for 53% of the company's revenue, so the massive growth they're clocking should eventually boost BlackBerry's overall top line. 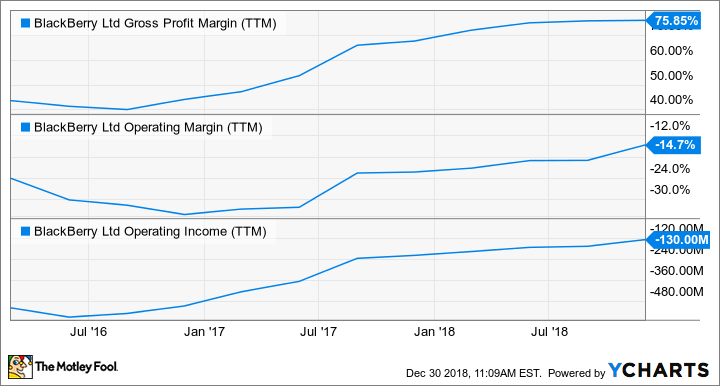 But more importantly, the top-line growth will filter down to the bottom line thanks to the high-margin nature of the company's software business. BlackBerry's margins have improved strongly in the past three fiscal years, allowing the company to massively cut its losses. BB Gross Profit Margin (TTM) data by YCharts. The company ended fiscal 2018 with a 75% gross margin level, and it's maintained the same in the ongoing fiscal year. BlackBerry aims to hit an 85% gross margin level in the long run, thanks to the growing clout of its software and services business. BlackBerry expects its software and services billings to increase by double digits in the current quarter. It won't be surprising to see it at least sustain that level in the long run, because it's pursuing opportunities in lucrative and fast-growing end markets, as mentioned. More importantly, the margin gains are having a positive effect on the company's bottom line. Last quarter, BlackBerry posted $28 million in adjusted net income, compared with $16 million in the prior-year period. So the company's profitability should get better as its margins hit a higher level. In all, there's a lot to like about BlackBerry. The company's software push has reaped rich rewards so far on the financial front, and the trend is likely to continue as the company adds more functionality and attracts more customers. All this makes BlackBerry stock a solid long-term bet as it makes a play on the secular growth of cybersecurity, enterprise security, and other verticals such as automotive.